Showing results for tags 'chamon'. With AoS 2.0 I really enjoy how the realms are coming to life, with more description and even bonus rules. Because of this with each army I start work on I try to pick a realm and base them accordingly. I put most of the realm representation in the basing of the army. I have a bigger picture idea working up to ArchAeon and the Everchosen where I want each of the non-daemon chaos allegiance factions based on being from a distinct realm, from each other, and the daemon side to be the same realm as the mortal halves but with a realm of chaos twist. So for example Nurgle Rotbringers May have realm of life bases and the Nurgle Daemons would have the same realm of life base, but with corruption and decay added. Then Archaeons basing would be a circle of transition between the 8 basing designs,4 realms both with and without chaos taint. I already have allocated Aqushy, realm of fire, to Tzeench Arcanists which ruled out that as an option. I wanted a darkish basing so that the lighter bone elements of the armour contrasted. 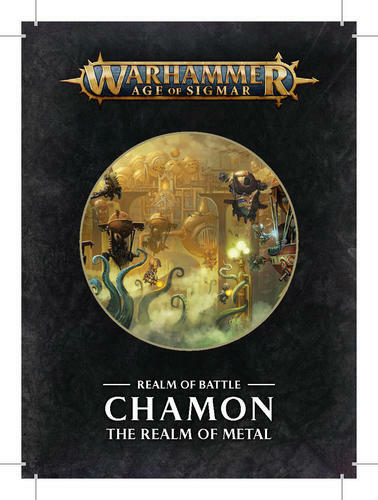 I eventually chose Chamon, the realm of metal, as I thought this would be a great setting for an army who through known for being crazed have a large dependence on the forging of weapons and armour. It will also, over time, be a good realm to be able to build up a faction narrative beyond drinking blood out of gathered skulls. For the basing I used cork with texture/grit paint to represent the earth which I dry brushed with metallics and finally applied a gloss black wash to darken it down. Then I mixed metallic paint, in this case Vallejo gold, with gloss varnish to created a flow of molten metal within the cracked earth. I allowed the metal to dry and then reapplied 1-2 more times to create volume. Frederick Holtz grew up in the shadow of Sigmar himself. The son of a nameless courtesan in the pleasure-houses of Azyr, he was raised as a ward of the State in the prestigious Starhammer Academy, not far from the high palaces of Azyrheim. Starhammer was where the elite future soldiers of the God-King were raised, and in the course of his upbringing Holtz had the chance to see Sigmar three times when the deity came to speak to the students about their duties as the leaders of tomorrow's wars. He passed all his tests with flying colors, and seemed poised to take a place as a petty officer in the school's own military regiment, the Starhammer Guard- at the last moment, though, his request was refused, and he returned to the general pool of graduates. Holtz spent a night alternating between fear and confusion, unable to understand why he had been passed over in favor of lesser students and wondering what his future might be now that his constant goal had been taken away. The next morning, a man came to see him. Missing an eye and three fingers, scarred and limping, he was clearly a veteran of hundreds of encounters. He introduced himself to Holtz as Templar-Captain Gregory MacDonald. He was the one who had pulled strings to have Holtz denied entry to the Guard, he explained. Though prestigious, the Starhammers were no place for a man of Holtz's talent and acuity. Instead, MacDonald offered Holtz a place in his retinue. Over the next decade, Holtz would earn his rank as a full Templar fighting enemies all across the Mortal Realms, rooting out corruption and heresy behind the lines and crushing monsters that threatened Sigmar's nascent domain. When MacDonald retired, Holtz took up the mantle of Templar-Captain in his stead, and after his destruction of the Ghoul-Triarchs of Ghyran and their cult received a promotion- from Azyrheim itself- elevating him to the rank of Templar-Marshal. In this capacity, Holtz had a regiment of his own to command, and it amused him as he began to poach graduates of his old academy from the Starhammers to fill his own ranks. Then, the Steelglass crusade was called in Chamon against a fragment of the clockwork legions of ancient Cypria. Suspecting Chaos corruption among the metal men, Holtz attached his regiment to the crusade, seeking to destroy whatever taint existed among the ruins. It was some of the hardest fighting that the Templar-Marshal had ever encountered. The enemy seemed to have planned for their every move, every stratagem, and his soldiers were often thrown into combats that would tax ten times their number. Holtz was unsurprised when evidence of Tzeentchi corruption was found among the clock-men and in the ruins of the great libraries they fought among, though he was perplexed as to why it was never his men who did the finding. As the Crusade reached its apogee, it approached one of the last great intact libraries of the ancient Cyprians. Its leadership called for the total destruction of the library to ensure the removal of all taint from the region. The night before the offensive was to begin, however, Holtz had a dream of a great beast buried under the library, thrashing against its chains. Waking suddenly, he was gripped by a horrible suspicion. His tomes confirmed that Cypria had waged long wars against Tzeentch at the time of the fall of the realms, serving as one of the Changer's most stalwart foes. Why, then, would there be evidence of taint among their defeated enemies? Rousing his men, he sent a messenger to the crusader lords asking them to delay their attack until he had had a chance to discern the library's true nature. A reconnaissance in force showed that much of the interior of the library was covered in warding runes, seals against the demonic. Holtz's pulse quickened as he sensed the malevolent presence lurking under its floor. The library was a prison for a powerful daemon, and if it was destroyed... At that moment shells from the crusade's artillery began to fall among the regiment. The attack had begun. Almost from the moment they left that place, Holtz's troops found themselves under attack- not by the Cyprian legions, but by the crusade's own forces. Advancing to the trenchline surrounding the library-mountain, Holtz found that his soldiers had been declared traitors by the crusade's leadership and ordered to be killed on sight. With the power of his oration and his reputation, Holtz convinced the gunners at the front lines to stand down and allow his men to pass. The artillery park was more difficult. It was commanded by the Bluefeathers, the personal regiment of General Kraft of the crusader lords. Here, the Templars had to fight doggedly, disabling the artillery pieces one by one. When he captured the Bluefeather commander, General Kraft's son-in-law, Holtz knew the truth. Heinrich Kraft bore the secret mark of Tzeentch on him. Steeling himself, Holtz and his soldiers attacked towards crusade headquarters. At first, the Templars faced human soldiers of the generals and lords' personal guards- but as they pressed closer to the command chamber, these became twisted by the power of Chaos, and their attacks sorcerous and strange. The command tent itself held the final horror- every general of the Crusade, their eyes lit by a strange blue glow, hands crackling with arcane lightning. At their head was General Kraft, whose visage had begun to twist into that of a daemon. He laughed when he saw Holtz. The Templar-General had failed, he said, and now he would erase one of the legacies of ancient Cypria and deal a blow to the plans of Sigmar the Deceiver. On the contrary, Holtz replied. He had stymied Kraft's aims. The library could not be destroyed now that the guns and soldiers of the army no longer obeyed the General, and Kraft and all of his conspirators would die. At this, his men opened fire, tearing the General and his fellows to shreds with a hail of gunshot- but Kraft alone did not fall. Holtz misunderstood Tzeentch's aim, he said. True, the daemon might stay imprisoned, but its clockwork wardens were destroyed... and so were Holtz and his regiment. At this, the tent and its surroundings exploded in blue fire, consuming Holtz and most of his soldiers. In the aftermath, the Steelglass crusade came to a halt, as the survivors limped back to friendly bases and regrouped, bereft of leadership. Still, Holtz had done a great service for the forces of Order, preventing the release of a daemon-prince and the opening of a portal to the Realm of Chaos, and exposing the treachery of high-ranking officers in the armies of Azyrheim. For this, he saw Sigmar again, as he was reforged into an incarnate vessel of the God-King's mighty will and released into the world again to do battle in His name. Indeed, Sigmar had a special assignment for him- Holtz would join the Death Watch as an unflinching agent of the God-King, and there keep watch over his fellows even as he was responsible for rooting out evil in the Mortal Realms. Surprisingly, Lord Celestant Steelios did not object to this- indeed, he's said to have laughed for hours when he heard about who was being assigned to his command. It has been almost a decade since that day, and Holtz continues his watch- ever ready, ever vigilant, ever eager in his war against the enemies of Sigmar. ------ The storytellers call Brother Holtz the Black Templar, Sigmar's Fire, the Holy Warrior, the Watchful, the Eyes of Azyr, the Sixteenth. Elizabeth Reike-Woerlitz was always a precocious child, outdoing her peers both in the library and on the training yard. Like all the children of that family, she had been raised on the stories of the lost wonders of the Mortal Realms, and she took them to heart- burning to see every corner of the Realms with her own eyes. By the time she was of age, she was a noted scholar, artist and soldier, holding a well-deserved officer's post in the Reike-Woerlitz Freeguild. She spurned any talk of marriage, preferring to seek her fortune and future in the rough-and-tumble beyond the walls of Azyrheim. In her third decade, the great crusade across the Realms began, and she leaped at the chance to be one of its countless leaders. Victories in Aqshy and Ghur brought her to the attention of some of Sigmar's lieutenants, but it was her inspired assault on the Dogfort in Ghyran that won her real acclaim. She was chosen to lead an expedition into Chamon, to seek out the remnants of the Dispossessed and any uncontacted Fyreslayer lodges that might be found. Months of careful searching, though, left her empty-handed and frustrated. In her sixth month, though, she struck gold, or rather silver. To that point the expedition had skirmished with metal-skinned Beastmen, but seen no real battles- only vast, empty lead flats and iron mountains in the distance. This changed overnight. Her sentries brought her a Duardin, clad in the ruined scraps of a strange mechanical suit of armor and grievously burned by molten metal. He gasped out that he and his kin and their flying ship had been entrapped by a monster in the mountains, a gigantic argent wyrm that was roasting them alive, one by one. The creature was immune to shot and shell- perhaps, though, it might be vulnerable to mortal magic. Swearing to the dying fugitive to rescue his friends and crewmates, Elizabeth and the expedition followed his tracks double-quick across the plains. In the foothills, they saw what they were seeking- a vast caldera with steam rising like a volcano. Creeping to its rim, Elizabeth saw a massive Duardin airship, sealed to the ground by silver chains, and a huge cage containing dozens upon dozens of its crew. At the center of the caldera was a spring, and in that spring rested a massive dragon made of molten silver. From one long claw dangled a single Duardin, screaming as he slowly roasted in his armor to the monster's amusement. Mindful of the fugitive's warning, Elizabeth divided the expedition in two. The majority would go to shatter the air vessel's chains and break open the cage, freeing the prisoners and preparing an escape route. She would have the more perilous task. With her arcane halberd, Grimfire, and a few chosen companions, she would need to distract the monster away from the others for long enough that they could do their job. Bullets couldn't hurt the wyrm, but they could attract its attention. At the first salvo, it raged up the slope of the caldera towards her party, burning up the ground as it came. When it reached the top, she struck- a swipe and thrust of her blade grievously wounded the beast, and she dodged nimbly out of the way of its counterattack. Time and again, it struck, and any one of its blows would have ended her- but she was agile and quick-witted, and she knew how to keep it off balance. She hit it again and again, and Grimfire cut away at its scales and tore at its flesh. Every time it roared in pain, and every time the air grew hotter as it bled. Then it belched out a massive stream of burning metal, and though Elizabeth was not struck by the flames she was wounded by the flying debris. The silver dragon loomed above her, pinning her fast with molten bonds that burned at her flesh. It laughed at her, mocking her for thinking that it, a creature older than the Realms themselves, could be defeated by her, a mortal. It would end her, the wyrm promised, and then perhaps it would encase her flesh in steel and make her its undying lieutenant. Her halberd would go into its treasure hoard, and her friends would be burned like the Duardin. Even as it said this, though, there came a great groaning from behind it- and Elizabeth saw the airship rising up, turning on the dragon, a gleaming hook planted at its bow. The wyrm swiveled in horror- and at that moment Elizabeth broke her restraints, plunging Grimfire into its heart even as the skyhook dug itself deep into the creature's metal flesh. In that moment, the argent monster died in a cataclysmic explosion of molten metal, burning Elizabeth horribly and staining the ground silver all around. ------ When she awoke, it was in the belly of the Duardin sky-ship. She could not feel her limbs, and her eyesight was clouded and indistinct. As she lay there, one of the crew, dressed in the finery of a sky-captain, entered and stood beside her. He introduced himself as Throndin Steelheart, the captain of the vessel, and her debtor. The wyrm's flesh and its treasure hoard were worth a dozen king's ransoms, he explained, and it was thanks to Elizabeth that he was here to exploit it. In exchange, the least he could do was make her whole again. While she had lain there, almost dead, much of her burned away by the heat of the monster's final blow, the Duardin had constructed a metal body to sustain and empower her. As Throndin spoke, her newly augmented mechanical body came to life, and her mechanical eyes focused with unnatural precision. She rose, half woman, half machine, ready to fight for her family and her god once again. ------ The storytellers call Sister Elizabeth the Iron Hand of Sigmar, the Neverforged, Conqueror of the Silver Wyrm, Skyfriend, the Bold, Queen of Battle, the Twelfth. I have some twisted wire trees and I never got round to adding putty and sculpting bark. Which may be a good thing! I've decided that my next project will be a set of Realm of Metal terrain, with mostly rocks with a metallic glean and some ponds of liquid metal (maybe even some mercury falls). Much chrome spray paint will be used. So I have trees made of metal, but just twisted wire is and will look lazy, but how do I improve on them? Any ideas for foliage would be great too?